Raise your hand if you are always looking for quick and delicious appetizers to either serve at a party or bring with you to a party? I am always searching for the perfect appetizer. I love appetizers (or picky foods as I like to call them.) These RITZ® Strawberry Bruschetta Bites are a perfect way to Snackify your next party. Enter below for a chance to win one of forty $100 Walmart e-Gift Cards (10 per week) by uploading an Instagram photo of your RITZ®-topped creation with #putitonaritzcontest. Purchase of RITZ® is not required. RITZ® Crackers is one pantry item I cannot live without. I always make sure that I have an assortment of RITZ® crackers in my pantry. They are great to have on hand for not only snacking but also whipping together a quick snack or appetizer. 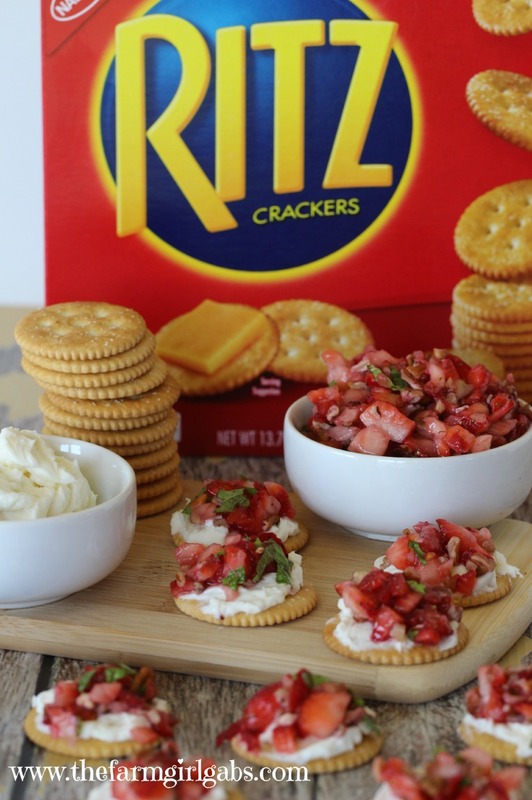 Now normally, I tend to pair RITZ® Crackers with savory toppings but I decided to take the sweet route with this RITZ® Strawberry Bruschetta Bites. I love a sweet and salty combination in food pairings. For this recipe, the salted RITZ® is topped with sweet marscapone cheese and an equally sweet strawberry bruschetta. It’s my deliciously sweet take on my favorite tomato bruschetta. It reminds me of spring! RITZ® crackers can be located in the cookie and cracker aisle at your local Walmart. 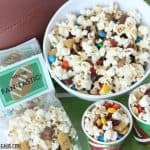 I was also able to purchase all the other ingredients I needed to make this simple recipe. I love the convenience of one-stop-shopping! I begin by finely chopping the strawberries. I combine them in a bowl with chopped candied pecans, agave syrup and chopped fresh mint. I then mix some marscapone cheese and powdered sugar together. If you can’t find marscapone cheese, cream cheese will work well too. I spread a layer of the sweetened cheese over each cracker. Then, simply top each cracker with the strawberry bruschetta. That’s it! So easy and delicious. Strawberry season is almost here on our farm. I can’t wait to make these with some of the fresh strawberries we grow! This snack is perfect to serve at a Mother’s Day brunch too. I love when one simple pantry staple like RITZ® Crackers can be turned into a real crowd-pleasing appetizer or snack. RITZ® Strawberry Bruschetta Bites With Marscapone Cheese are a quick and easy appetizer or snack to whip together for your next party. This sweet snack is delicious! In small bowl, mix together marscapone cheese and powdered sugar. Set aside. Finely chop strawberries and add to a medium bowl. Add agave nectar, candied pecans and fresh mint to strawberries and stir to incorporate. 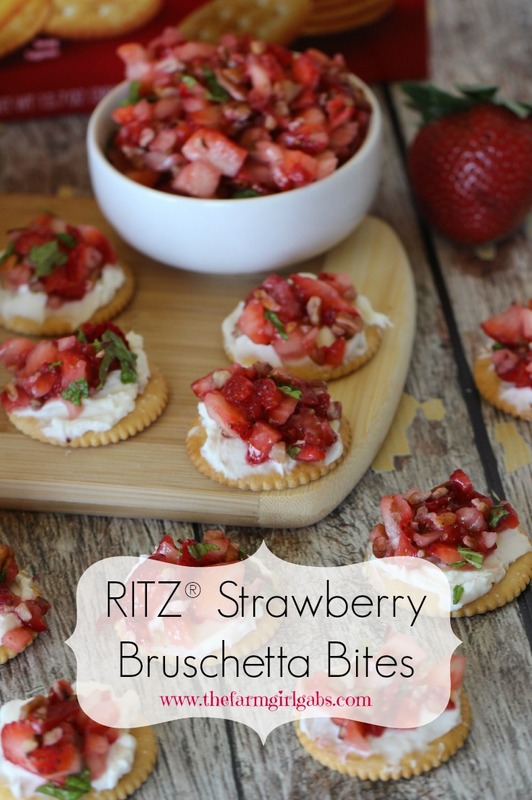 Top each RITZ® Cracker with a layer of sweetened marscapone and then top with one teaspoon of the strawberry bruschetta. What are some of the ways you like to enjoy RITZ® Crackers? I hope you give this way a try. It’s the perfect springtime snack.